One of the nice feedbacks that I got from my son’s, Philip, kindergarten teacher is about his good handwriting. To think that a year ago, he couldn’t even hold a pencil correctly. I believe there are two major reasons for his improvement: daily practice (he loves to write every day) and a handful of tracing apps to help him train. Two apps that I personally recommend are LetterSchool and Writing Wizard. The first is suitable for juniors ages two and under, while the latter makes a good follow-up once they have mastered tracing basic letters and numbers. Writing Wizard helps Philip practice writing in smaller sizes, something that LetterSchool was not designed for. Today, I will highlight a third app that I’d recommend for juniors ages four to eight: Intro to Cursive, a brand new release from Montessorium, one of my favorite developers. This app introduces cursive letters and teaches juniors to write them. Intro to Cursive introduces juniors to beautiful, cursive handwriting in D’Nealian style. When you start the app, you will see the main menu divided into four quadrants. The top quadrants let kids practice writing three cursive letters at a time. The app uses a Montessori approach, and only shows three letters in random, instead of in alphabetical, order. The top left quadrant introduces writers to lowercase cursive letters — from simple ones such as e, l, and h, to ones that require writers to trace back in a circular motion such as a, c, and o. The lowercase mode also introduces uncommon forms of s and z, and shows the difference between cursive g and q. Finally, writers can practice writing cursive letters that require them to go back and add dots/crosses to complete said letters, such as i, j, t, and x. The top right quadrant introduces writers to uppercase cursive letters, including less familiar ones such as G, I, Q, and Z. Writers can also see how some uppercase letters may require non-continuous strokes, such as D, F, H, T and X. If your juniors want to practice with a focused set of letters, Intro to Cursive offers a free-form practice mode. This mode is located in the bottom left quadrant. It allows writers to pick specific letters and write as many times as they like. They can also switch between lowercase and uppercase. This mode also lets them practice writing phonograms, such as ai, ee, oy, ch, and qu. Finally, Intro to Cursive offers a sandbox for free-form writing. The sandbox is located on the bottom right quadrant of the main menu. This mode allows writers to practice writing longer words in cursive. Parents can also use it as a game by challenging their juniors to draw the letters that appear briefly in the sandbox. Intro to Cursive lets juniors learn about phonics and phonograms too. Intro to Cursive not only teaches kids how to write, but it also teaches them about letter sounds (in the lowercase mode) and letter names (in the uppercase mode). In the free-form practice mode, juniors can also learn about phonograms. The app uses D’Nealian style to teach cursive handwriting for English. 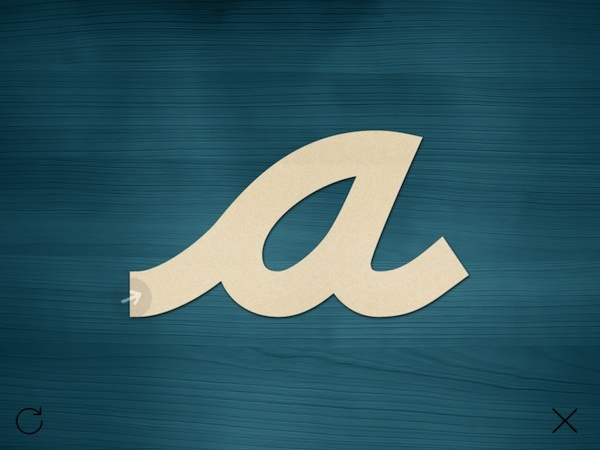 The developer plans to add cursive handwriting for French, German, and Spanish. If you’re not sure how to teach your juniors to write in cursive, the first two modes in this app offer guided and interactive exercises. The app will show a moving cursor which shows how a letter should be written. Even though Common Core State Standards does not require children to learn writing in cursive, I think that it’s an important skill to master. If you’re still undecided, the developer put up an infographic that might help you see the benefits of cursive writing. Because all letters in cursive start on a base line and because the pen moves fluidly from left to right, cursive is easier to learn for dyslexic students who have trouble forming words correctly. Each letter in Intro to Cursive is accompanied with an interactive guide. I remember learning cursive writing when I was in Grade 2, so playing with this app brings back some memories. I spent a lot of time in the sandbox showing Philip how to write his name and his friends’ names. Cursive writing is a great way to help my juniors tell the differences between the number 1, lowercase l, and uppercase I. It’s also a great way for Philip to step up his handwriting skills. Writing in cursive really helps with his fine motor skills because it’s much harder than writing block letters in smaller sizes. You can also practice free-form and longer-form of cursive writing in the sandbox mode. Intro to Cursive is a great way to introduce cursive writing to juniors, especially if they have mastered writing in block. Cursive writing improves their handwriting skills, and is an essential part of a complete life lesson in handwriting. If you’re planning to teach your juniors how to write in cursive, this is an app you must have. Intro to Cursive is available for iPad/iPhone.